Come to live in South Korea, and you’ll find that everything you used to use in the old country has a locally made equivalent in Korea. That goes not just for goods but for services, even — maybe especially — services on the internet. For nearly 20 years, Koreans have done most of their searching not on Google but on a portal site called Naver, which also offers its own, much more functional (in Korea, that is) map application. They look up restaurants not on Yelp but Diningcode, find apartments not on Craigslist or Zillow but Zigbang or Dabang, and have long done their messaging through a service called Kakaotalk. Alongside the Korean Wikipedia exists the jokier but often more detailed Namuwiki. Those named are hardly the only options, since each category with any potential user base at all tends to produce an abundance of Korean competitors, no single one of which ever seems to attain complete dominance. Apart from the government’s reluctance to allow the release of detailed map data to foreign companies (ostensibly in the name of national security), this situation hasn’t arisen, for the most part, as a matter of policy, but from the perceived need to address the supposedly unique expectations and problems of the Korean consumer, which itself might go all the way back to the exports-good-imports-bad developmental ideology of the 1960s and 70s. It has also given rise to a Korean equivalent of TED Talks, the series of short video lectures that for well over a decade have generated praise, criticism, and hundreds of millions of views. 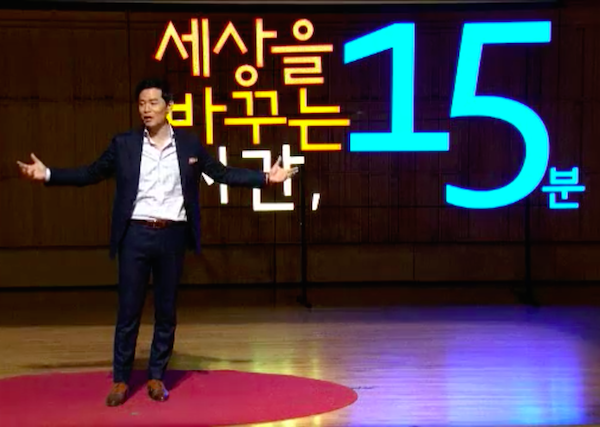 Korea’s own TED Talks launched in 2011, calling itself “Sebashi” (세바시), a contraction of sesangeul bakkuneun shigan 15 bun (세상을 바꾸는 시간 15분), officially rendered in English as “The Fifteen Minutes that Changes the World.” Most of its videos run over 15 minutes, some well over; however much its creators have copied from the TED Talk format, they haven’t applied its famously rigid 18-minute limit. TED curator Chris Anderson has justified that length as “long enough to be serious and short enough to hold people’s attention,” with the added advantage of being “the length of a coffee break.” Many a Korean office worker combines coffee break and cigarette break, meaning they take them outside, even during a chilly Seoul winter like this one. This was written by Colin Marshall. Posted on Monday, January 15, 2018, at 6:30 am. Filed under Korea Blog. Bookmark the permalink. Follow comments here with the RSS feed. Comments are closed, but you can leave a trackback.